• Keep the battery securely mounted. • Keep the battery top clean and dry. • Keep the terminals and connections clean, tight, and coated with petroleum jelly or terminal grease. • Rinse any spilled electrolyte from the battery immediately with a solution of water and baking soda. 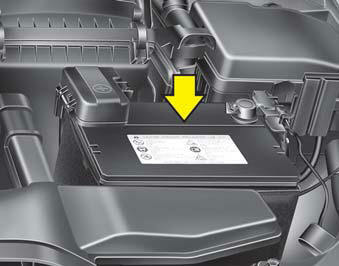 • If the vehicle is not going to be used for an extended time, disconnect the battery cables. instructions carefully when handling a battery. and all other flames or sparks away from the battery. combustible gas, is always present in battery cells and may explode if ignited. of the reach of children because batteries contain highly corrosive SULFURIC ACID. Do not allow battery acid to contact your skin, eyes, clothing or paint finish. gets into your eyes, flush your eyes with clean water for at least 15 minutes and get immediate medical attention. If electrolyte gets on your skin, thoroughly wash the contacted area. If you feel a pain or a burning sensation, get medical attention immediately. when charging or working near a battery. Always provide ventilation when working in an enclosed space. disposed battery can be harmful to the environment and human health. Dispose the battery according to your local law(s) or regulation. • When lifting a plastic-cased battery, excessive pressure on the case may cause battery acid to leak, resulting in personal injury. Lift with a battery carrier or with your hands on opposite corners. • The electrical ignition system works with high voltage. Never touch these components with the engine running or the ignition switched on. Failure to follow the above warnings can result in serious bodily injury or death.• Never attempt to recharge the battery when the battery cables are connected. • When you don’t use the vehicle for a long time in the low temperature, remove the battery and store it indoors. • Always charge the battery fully to prevent the battery case damaged in low temperatures.